When I first started Belly Dancing I was also an Anthropology major, so of course I was very interested in finding the cultural roots of this wonderful dance. I was able to find a video rental store run by an Egyptian and he had videos of the classic dancers of the Golden Cinema Era. These videos were my first teachers. After I devoured them and asked him a million questions, he mentioned to me Egypt had interesting folklore dance… this started me on a lifetime search. Research and information in the early days was difficult, I would find one piece of information, one cherished puzzle piece; a movement, costume information, or a rhythm for example. Later I would find another piece of information, another exciting puzzle piece, I felt they should fit together, I tried very hard to make them fit. 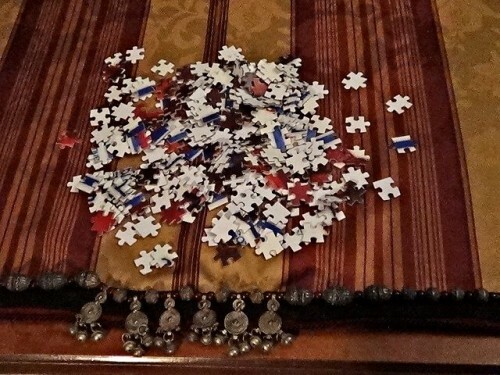 The problem was that I was trying to make one large puzzle called “Egyptian Folklore”. But this was an inauthentic construct. There are different regions in Egypt, each with different dances. Each of these regions consists of many different types of dancers; some people dance for fun in their homes, other people identify as professional dancers, some use folkloric movement only as entertainment, some strive to represent the different regions by conducting fieldwork and crafting it for the theater stage. As I tried to cope with all this information, a visual came to me; for each region there were six different tables, each with its own puzzle. Each of these separate puzzles represent a different category of people dancing. This construct seems to reflect Egyptians’ view, although some of it may seem foreign to us in the west. In this post we will discuss the first three tables, where the dancers are dancing in their own region and the dances they are doing are part of their own culture. The last three tables, where dancers are performing folkloric dances not of their own region, will be covered in Part II. Regular people dance with their friends or family. Home-style dance may be private in homes, or in the public. They may be talented or untalented dancers, but this is not the important criteria of this category. There may be a performance aspect (in private, for each other) in some regions, but most importantly they don’t get paid. EXAMPLE: at a marriage, family members dance with each other. Post by “Journey through Egypt” – JtE. A Sa’idi Rebaba player and his son. The professional dancers and the audience are living in the same area. The paid professional dancers and non-professional are two different groups, it is not a measure of ability. A homestyle woman might dance better than a professional, but this is not the criteria. A professional dancer has to be publicly strong, to be able to be the boss of a group of men (musicians), and to be strong enough to stand up to an Impresario, a Nightclub owner, or even a drunk loud audience non-family man. Part of the public’s fascination with professional dancers is their strength. A family woman, in contrast, should not go out at night, call attention to herself and be paid to do so, possibly be wearing less clothing than social norms, or be amongst non-family men, especially if they are drinking. Often the professional dancers are born into a group, or tribe, or family that are professional entertainers, dancers, and musicians; such as the ‘awalem on Mohamed Ali street of Cairo, or the Banat Mazin Ghawazee of Luxor. EXAMPLE: at a marriage, these are the entertainers the family hires to perform. For this “table” the dancers, musicians, and audience all live in the same area. The Regional Governorate Troupe of Aswan performing. What is a Regional Governorate Troupe and where did it come from? As part of the mid-1960’s development of the National Folkloric Troupes, Egypt also developed “Folk Arts” groups for each “governorate” (similar to a small state). These government sponsored “Folk Art” troupes for music and dance would develop choreographies of dances from their region (larger than a “governorate”). These troupes would put on shows in their own area several months a year, then tour around Egypt sharing their regional dances with people of other regions. After the revolution in 1952 Egypt was finally under Egyptian rule for the first time in over 1000 years. The Egyptian government felt it was important that the previously separated “governorates” should be acquainted with each other, developing an Egyptian identity by understanding and accepting each other. For our construct, it is important to note that the dancers, musicians, and audience all live in the same area. Most of the dances they perform are also of their own area. But the troupe is sponsored by the Egyptian government, the director is picked by the “Ministry of Culture” and the performers are paid government employees. They also learn dances from other regions as part of the sharing between regions. These Regional Governorate Troupes for Folk Art, also sometimes called “Culture Palace” developed out of the 1960’s category of “Folklore Groups” and have a good reputation. The “regional governorate troupe” may get a local director, or one from a different region. For example the Nubian troupe in Aswan has a director who is Nubian and is not only familiar with the current dances of the region, but also of the dances from before the relocation. He tries to stay true to the local identity and educate the younger generation to the dances of their identity. On the other hand the director could be from a different region, such as when the director of the Marsa Matruh governorate troupe was Sa’idi (Marsa Matruh is on the north coast and covers the dances of Siwa and of the Western Desert Bedouin, while the Sa’id is on the Nile Valley). These are totally different peoples with different esthetics of movement and costuming which tends to result in a fusion of regions. It is possible that a few of the Troupe dancers are also professional dancers, but the norm is that the dancers are the youth of the area (Table 1). Dancers of the governorate troupe do not stay out late, are chaperoned, wear clothing that is covered enough to be worn on the street, dance where there is no alcohol, and the women do not have to talk to men if they don’t want to. It is up to the troupe’s director to communicate with theater owners, musicians, and the government bureaucracy above them. Example: Your family and friends go the local governorate troupe theater and see a show that includes familiar music and dances of your region, and possibly some of your friends are either playing music or dancing. So as you can see, the first three tables deal with the people dancing within an environment where dancer and audience share the same culture, speak the same movement language. Next week we will talk about tables 4 -6 which take this dance outside of the region it originated in, and begins to refer to it as the “other”. Make sure you’re subscribed to the newsletter to make sure you know the moment we post Part II! I would like to thank Usama Salama for his research help on this topic. He is Egyptian, from the Delta, previously part of the Al Sharqeia Governorate Troupe and Firqit Reda, and now lives in Berlin Germany. Thank you Usama! 5 Responses to What If We Viewed Egyptian Folklore As A Puzzle? Excellent way to present the many facets of Egyptian dance! That’s my inner anthropologist (BA degree), long time dancer, many time visitor to Egypt speaking. Thank you for writing and sharing this! Thank you, Sahra. Clarification and cultural context are needed more than ever. I felt like I had taken a trip back to Egypt while watching the videos. Thank you very much for researching and writing about what you have experienced and learned. You inspire me! I am looking forward to Jet 1 in LA this March.